Eysturoy, meaning "East Island" is the second largest island in the Faroes, both in population and in size. 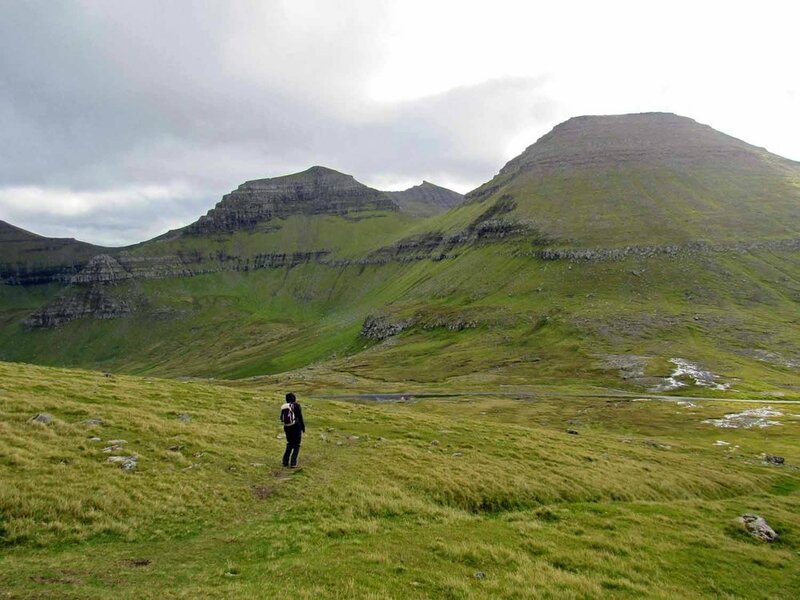 The terrain of Eysturoy is some of the most mountainous of the Faroes and bears 66 peaks. Among these is the Faroes’ tallest peak, Slættaratindur, meaning “Flat Peak” or “Flat Summit”. We came to hike it! The peak stands at 880 meters at its highest point, can be reached from Gjógv or Eiðisskarð. We started our hike in Eiðisskarð. The hike starts from the fence in the parking lot, but there isn’t a clear trail at this point. Just continue making your way up the mountain. You may run into a sheep or two along the way, and you will come across a trail that leads to the summit. The hike is about 5-6 kilometers total and takes about 2.5 hours to complete. On a clear day, you will be rewarded with views of all islands in the archipelago from the summit. 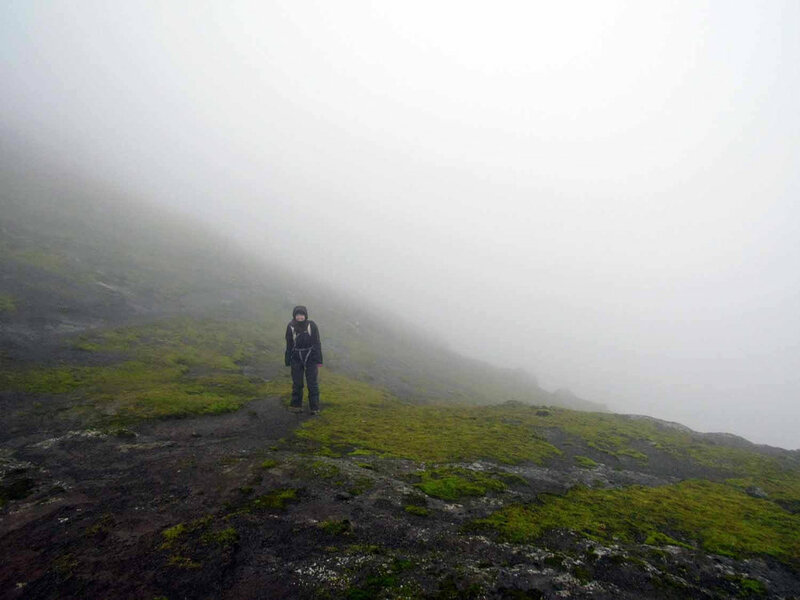 While the summit was very foggy for us, we caught amazing views on the way and this hike was still one of the highlights of our trip to the Faroes. For more detailed trail info, check out the Faroe Islands official travel website. Layer up -hiking into the fog gets chilly! Also, at times visibility may be poor. Watch your step as it can get slick when wet. Slættaratindur is shrinking! As long as anyone can remember, Slættaratindur measures 882 meters in height; however, recent measurements show the mountain now stands 880 meters high - two meters shorter than previously believed! Eidi, meaning “isthmus” in Faroese, sits just down the road from Slættaratindur, on the west side. It was settled by Vikings in the 9th century, and although there isn’t tons to see, we never seem to tire of touring the quaint towns. Gjógv is the northernmost city on the island of Eysturoy. It’s name, meaning “Gorge” in Faroese, was inspired by the 200 meter long gorge that runs from the sea into the village. Gjógv has one of the best natural harbors in the Faroes and is known for its idyllic scenery. We enjoyed the charm of this town and taking a stroll down to the docks of the harbor. As you approach the village of Oyndarfjørður, follow the sign for the path down to the “Rinkusteinar” (rocking stones). A rocking stone, also called a logan or logan-stone, is a boulder so delicately balanced that small forces cause it to rock back and forth. Oyndarfjørður is home to two rocking stones, one of which, still moves. The other sits still while wedged between two stone blocks. Located on the edge of the village of Toftanes, these ruins date back to the 10th century. The largest ruin, a 72-foot longhouse can be seen with among a few other smaller building foundations.